A couple of days ago, I shared a very affordable daily body wash. But as it goes with mass and affordable products, it doesn’t satisfy the needs of those who prefer something natural or organic. So here’s one that is. Natural and organic I mean. Introducing Marius Fabre, a brand I warrant few of us have come across thus far. It is distributed locally by The Brand Story, alongside other niche brands and products, primarily in the bath and body department – a category I love to indulge in! Marius Fabre is the name of the founder of the brand, who started up brewing potions and soaps in his garden shed in Salon-de-Provence at the tender age of 22, back in 1900. Yes folks, 1900. This is a soap company that is over a century old! Their speciality are their solid soaps but I suppose we have to move with the times. 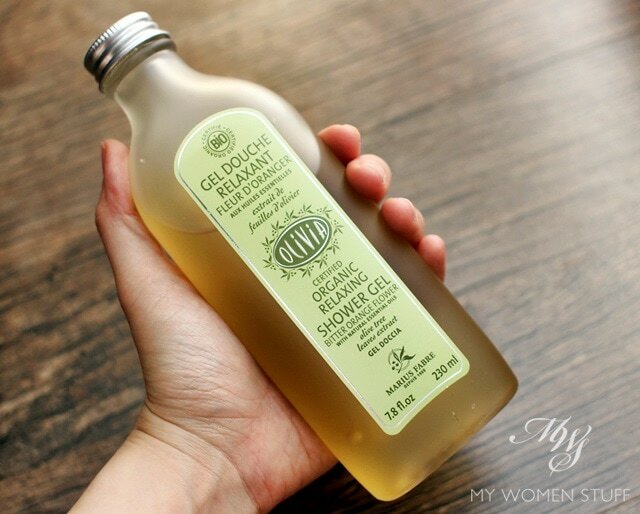 Modern times call for shower gels, and Marius Fabre delivers in this one from the Olivia range – an Organic Relaxing Shower Gel with Bitter Orange Flower essential oils. The first thing I noted was the packaging. The shower gel is packaged in an opaque bottle that looks very much like frosted glass, but is in fact, plastic! Now, as much as I like the use of glass in my skincare products, I opt for plastic every time for the shower. I had a glass jar of body scrub once. An accident in the shower left me with a lot of cleaning and a bloody foot. So, lesson learnt. No more glass thingamajics in the shower! So yes, I like the rather old school packaging, with the metal twist off cap and all. I’m not crazy about the wide open mouth, because it does get hard to control the amount of product you use, and to be honest, you don’t need very much. 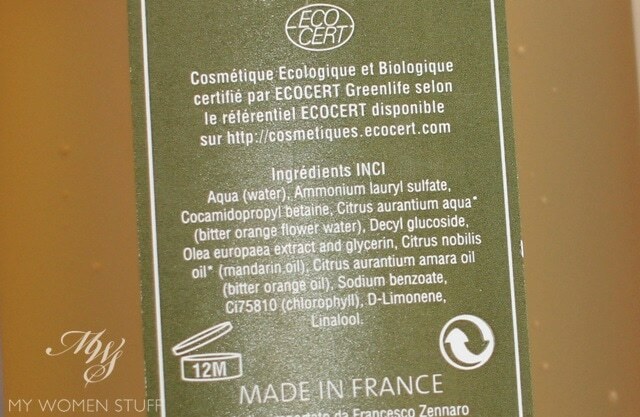 The shower gel uses olive leaf extract and orange flower water, and it is scented with essential oils of bitter orange and mandarin. You might be wondering at this point how something that sounds so zesty and citrusy could possibly be relaxing, right? Shouldn’t it be uplifting? Energizing? Ah, have you smelled bitter orange? It has a mellow, slightly musky masculine scent that isn’t zesty at all. Contrary to what we have been led to believe, it is truly a relaxing scent and a wonderful way to wind down at the end of the day. On days when the weather feels cool, the scent makes me feel warm, as if it is infused with the warm sun. As with many natural and organic products, the shower gel does not lather up very much, but it does clean, the essential oils do a lot to relax you in the hot shower, and it really does mellow my mood. Just what I reach for, at the end of a long, tiring day. 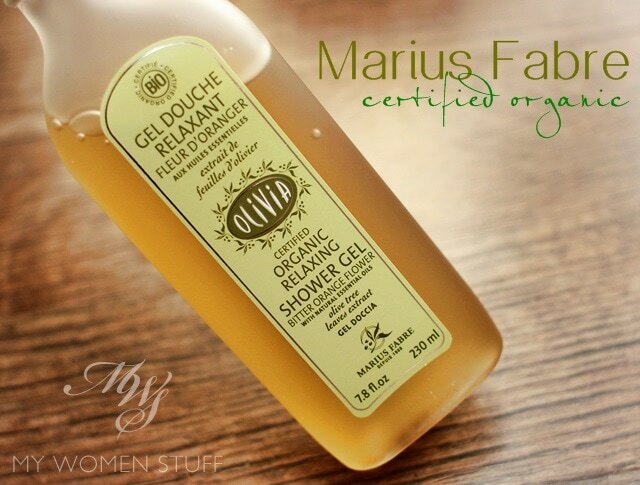 The Marius Fabre Olivia Organic Relaxing Shower Gel with Bitter Orange Flower essential oil extracts is a certified organic product by EcoCert and Cosmetique Bio. The non-drying shower gel contains olive leaf extract and the scent is that of bitter orange and mandarin, which is a very surprisingly relaxing scent. It smells slightly spicy, warm and a little masculine. A little product does go a long way, and I also like the simple packaging that looks old school, yet is in modern plastic. Looks lovely in the shower, smells lovely and feels lovely. Pricetag is a little unlovely, but that’s the trade off I guess. Here is the ingredient list. Have you heard of Marius Fabre before this? Are you into natural or organic bath products? Love the packaging on this! I also love the way glass bottles look, but find them awkward to use and am scared to use them near the bath because of an incident very similar to the one you described. The first thing I thought when I saw this post was: I could never have a glass bottle in my shower, I’ll end up hurting myself in no time! But it’s plastic so I can go back to just love the packaging, it’s so nice. I’ve tried a few organic bath products -mainly soap bars bought at farmers’ market and things like that- and I like them. This sounds really good, I’d love to try it! I’ve been ordering Marius Fabre products from their website and having them delivered to my Paris apartment. The olive oil bar soaps are amazing. I like the savon liquide de Marseille (thym et aneth) and the savon noir liquide (very gentle cleansing for clothes, dishes, etc.). Ooh! You’re the first person who seems to know what I’m talking about Adrianna LOL 😀 Happy to have helped you out – I’m going to try the solid soap next! Thanks for the sharing Paris B! I never heard of this brand before. I’m also not personally into nor against natural or organic products. However, usually I ll go for affordable everyday body wash in view of the prices. Anyway, it is still worth a try! I’d never come across it before either but it’s quite nice. Something different, I’d say – maybe for gifting especially with the gifting season almost upon us! Hahaha! You totally crack me up 😀 I’m sure it’s easily found in Europe and they have various other bath and body products too! Very interesting 😀 I’d love to visit Provence – so many good French brands have come out of there.